To make your building stronger, it is essential to choose perfect quality of steel in construction. 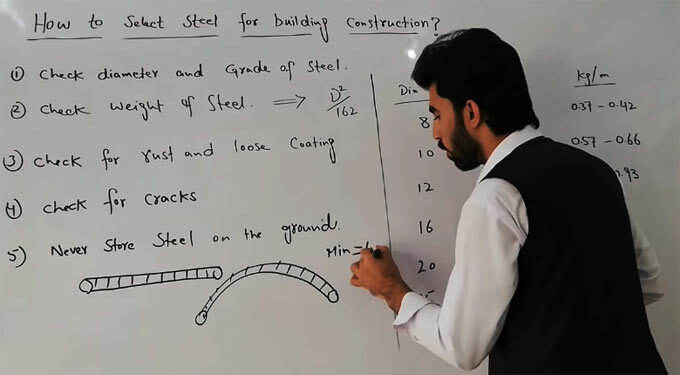 In this regard, the renowned civil engineer Mr. Sami Ullah, has presented a useful video that shows some useful criterion for the selection of standard quality steel. Diameter of the bar differs as per load condition. Normally, 8mm, 10mm , 12mm steel bars are used in slabs since load is less relating to beam , column, footing. 8mm bar usually applied in one way slab as distribution bar (secondary steel). In beam, bars with diameter in excess of 12mm are used (based on load). In column, bars with diameter in excess of 12 mm are used (based on load). In footing, steel bars with diameter 10 mm or over are used (based on loading). Bars available in the market range from 8mm, 10mm, 12mm, 16mm, 20mm, 25mm, 28mm, 36mm and 42mm. Larger diameter like 64mm and 128mm should be ordered specially from steel plant for manufacturing. The weight of steel is calculated by the formula D2/162. The measuring unit of dia is provided in mm and the measuring unit for weight is provided in kg/m. Verify for cracks – When the steel is bent at 180 degree, no cracks should be developed. Never hoard steel on the ground – To avoid rusting, the steel should not placed on ground.